Welcome to Trendy Hotel, elegantly situated on the East Banks of the Han River. A self-rated three star hotel in the heart of Danang City offering magnificent view over the Han River and the Danang City skyline. 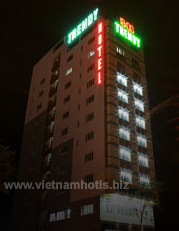 Danang City is a destination in itself, Danang has a wealth of attractions and cultural venues, in addition to be perfectly situated for exploring Three World Heritage: Hue City, Hoi an Ancient town and My son Holyland.Idealy located in Danang, the Trendy Hotel is an great place for vacations. All the newly built guestrooms at the hotel have all the comfort expected in a hotel in its class to make guests feel at home. - Breakfast buffet, mineral water, cafe and tea free. Restaurant also has a bar with a professional team of blending, guests can enjoy a variety of special drinksStaff enthusiasm and professionalism of Trendy restaurants are honored to serve your guests! Microdermabrasion with Aesthetic Peel microdermabrasion machine. Meet the needs visit and welcome you to travel in the city, to tourist sites such as Hoi An, My Son, Hue ... Trendy hotel with more services for car rental travel self drive or the driver with preferential prices for guests staying.